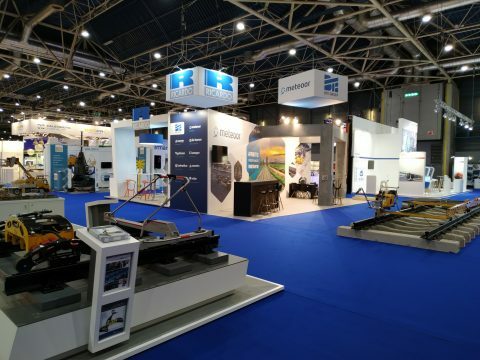 Tuesday March 26 is the first day of RailTech Europe at Jaarbeurs Utrecht. In this liveblog you can read everything that happens at this big rail event. 15.30: After a short Q&A session, the ERTMS conference is over. We have heard many good presentations on such difficult and crucial topic to the railway sector system. However, ERTMS is impossible without simple things. Simon Fletcher, the chairman of today’s event, tries to define them: challenges, solutions, complex, cooperation, communication. Let us meet at the network drinks and not forget about the two other days dedicated to energy saving and predictive maintenance. 15.05: Alfred Veider, Vice President of Thales, gives a presentation on how to increase the capacity of ERTMS. He specifies the promising Hybrid level 3 version, which has already been tested on the railway networks of UK, Netherlands and France. Also, Veider stresses the necessary integration of ERTMS with management systems of other modes of transport. “The train is always a multimodal vehicle. You can not take a train from your home, you need to use another mode of transport”, he says. 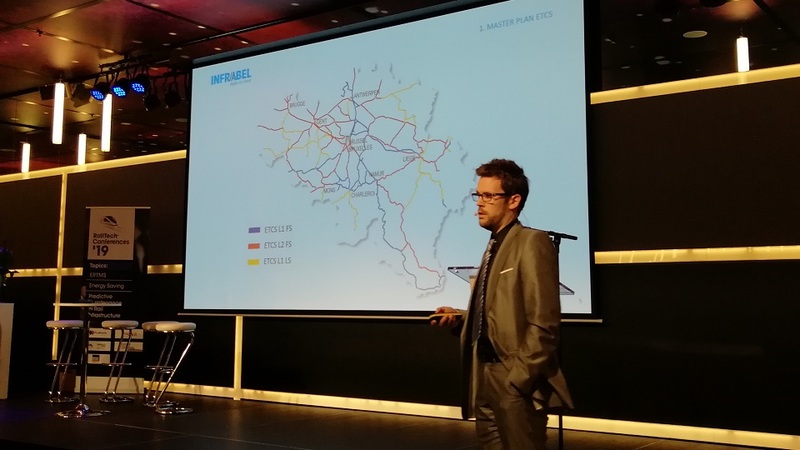 14.50: The final ERTMS session begins with a report of Jeremy Debast, Senior ERTMS/ETCS Signalling Engineer at Infrabel. He tells about the ETCS implementation in Belgium. Currently, Infrabel operates three levels of the system: ETCS Level 1 LS, ETCS Level 1 FS and ETCS Level 2 FS. This results in the operation of various types of rolling stock suitable for different systems. By 2025 the entire network should be equipped with ETCS Level 2 system. 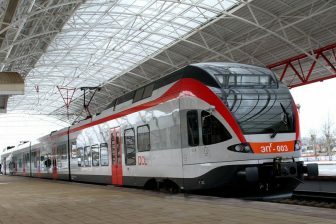 13.45: Jean Koulischer, Alstom’s Digital Mobility/Signalling Mainline pre-tendering Director, gives a presentation on the company’s project in the deployment of ETCS Level 2 system to Austrian Federal Railways (ÖBB). 13.25: Sonja Caraian, TMS Process Test Manager within the Danish Signalling Programme, tells about the Danish experience in ERTMS deployment. 13.10: Let us return to ERTMS. The third session starts with a presentation of Peter Zijdemans, Principal Consultant of Ricardo Rail. He explains how to improve the implementation process of ERTMS. 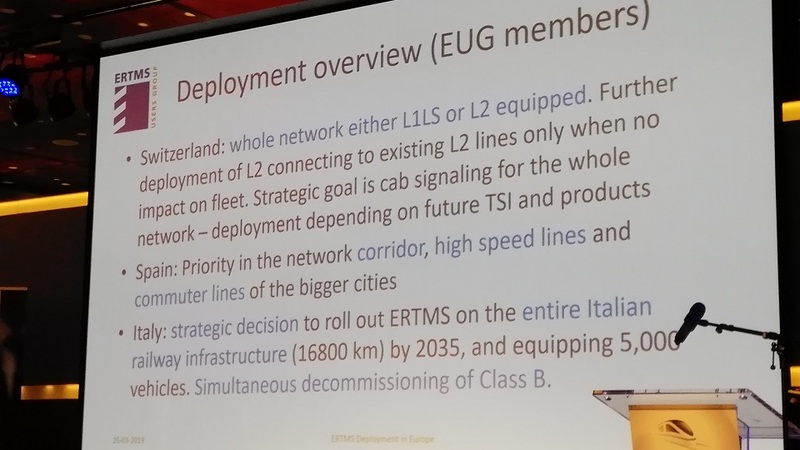 He notes that the map of the ERTMS network looks like a patchwork due to the different speeds of implementation and different levels of systems. According to Zijdemans, the installation of retrofitting onboard equipment is estimated at around 500 thousand Euros per locomotive. It is a high cost for railway operators. However, the railway undertakings can reduce their costs in this area by avoiding national test requirements, installing the system of one level instead of several levels and generations, etc. 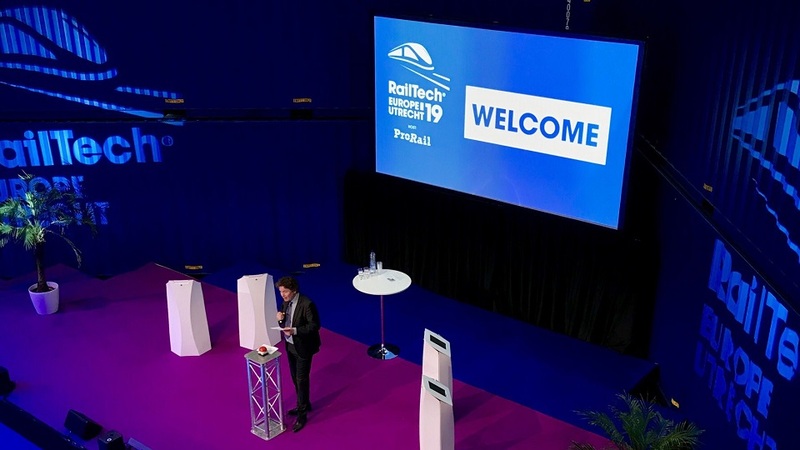 12.20: CEO of ProMedia Joan Blaas launches the official opening of RailTech Europe. The ceremony is also hosted by Matthias Ruete of the European Commission, CEO of NS Roger van Boxtel, Chief Operational Officer John Voppen of ProRail and Libor Lochman of CER. 12.10: Networking lunch break. Bon appétit! 11.40: Roundtable discussion on ‘How to deal with updates of ERTMS systems?’ . Michiel Vijverberg (ProRail), Esme Kalshoven (Nederlandse Spoorwegen), Alfred Veider (Thales) and Jean Koulischer (Alstom) discuss various aspects of ERTMS deployment including safety, personnel and procurement issues, etc. 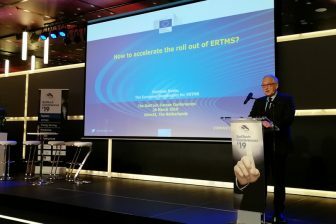 11.30: Wim Knopperts, Programme director ERTMS at ProRail, gives a presentation ‘Good cooperation is key to successfully deploying ERTMS in the Netherlands’. “Programme harmonisation is almost finished. We will send it to our parliament in a few weeks. The political decision-making process may be finished”, he notes. Knopperts forecasts that ProRail can start the ERTMS programme in December. 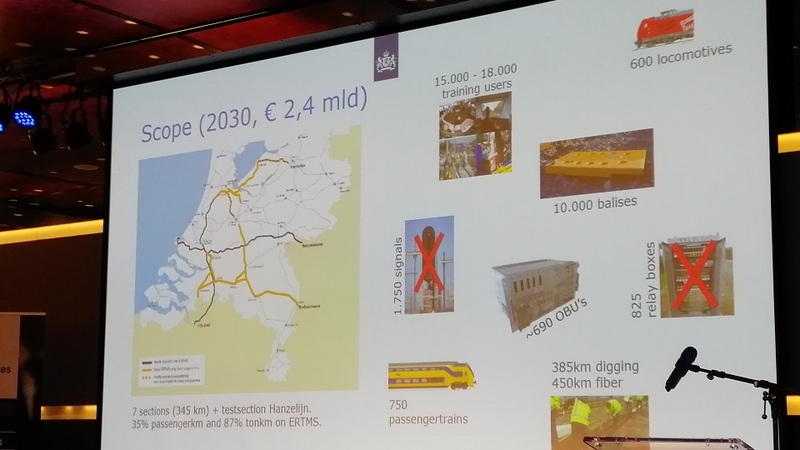 “Cooperation is a key in successfully implementing ERTMS in the Netherlands”, Knopperts sums up. 11.05: The second session dedicated to the Dutch implementation plan of ERTMS is opened. Hugo Thomassen from the country’s Ministry of Infrastructure and Water Management explains why the Netherlands needs this system and how it will be deployed. According to him, the Dutch ERTMS plan includes implementation of the system on seven track sections with a total length of 345 kilometres, investments in new rolling stock and upgrading the existing fleet as well as training, replacement of old equipment, etc. The project requires investments of 2.4 billion Euros. 10.05: Q&A. Matthias Ruete and Michel Ruesen answer various questions about language problems in ERTMS deployment, investments, Brexit and even possible competition of Chinese analogue systems. One of the questions is ‘What is the situation with ERTMS deployment in Central and Eastern Europe?’. Michel Ruesen answers that countries from this region are considering this but they are mostly focused on the infrastructure upgrading now. “They still in their mind the class B system,” he notes. Matthias Ruete adds that he will discuss ERTMS deployment in Romania and Baltic states. 10.00: The RailTech Europe exhibition starts. It will be carried out simultaneously with the conferences. 09.30: Michel Ruesen, Managing Director ERTMS Users Group, starts his presentation. 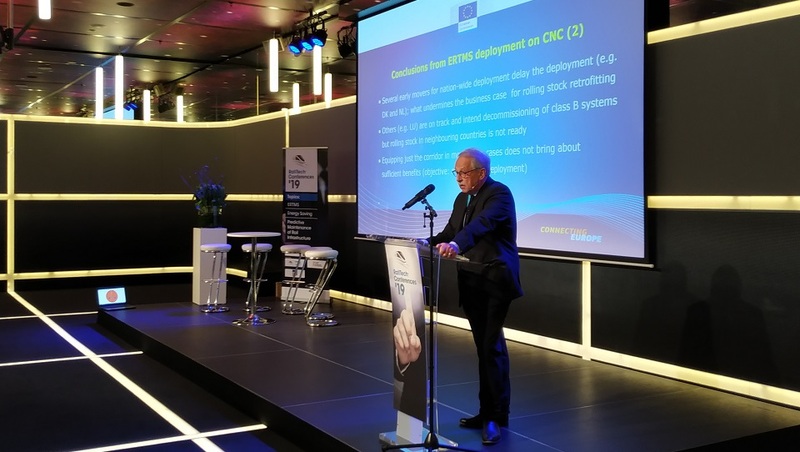 He tells in details about the experience and plans of different European countries that are members of the ERTMS Users Group (EUG) in the deployment of the system. Thus, Denmark and Norway are converting to the ERTMS system Level 2 across their entire networks. 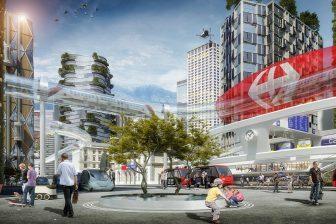 Denmark plans to do this by 2030, Norway by 2034. Sweden is working on deployment of the latest edition of the system – B3R2. The Netherlands has equipped five lines with ERTMS. The implemention of the Level 2 edition is only considered. Germany initially opposed ERTMS due to the implementation of its own interlocking system. Finally, the country’s government changed its mind and decided to roll out ERTMS. “We have to say ‘good-bye’ to our national design philosophy”, Michel Ruesen concludes. 09.10: Matthias Ruete, European Coordinator for ERTMS, speaks about implementing ERTMS in Europe. He specifies several problems in this area, especially on different speeds in deployment of ERTMS in European countries. “We also have ERTMS deserts in Europe”, he says. He means that some railways are equipped with the ERTMS system but there is no modern rolling stock to run on them. Ruete notices that European countries should coordinate their work in ERTMS deployment on the railway corridors. According to him, cooperation and coordination are the obligatory means for implementing ERTMS in the EU. “We are moving away from an ERTMS patchwork to an ERTMS network. But we are not there yet”, Ruete says. 9.05: Simon Fletcher, director Standardisation and coordinator Europe at UIC takes the stage. Fletcher will be chairman of the first day of the conference. 7.15: The national Dutch television visits RailTech Europe for its breakfast show. ProMedia-director Joan Blaas explains what visitors can expect at the event. Check the televisions how here. (item starts at 7.40 min).